Mr. Cocreham pitched infrequently for Boston that year, starting only three games and participating not at all in the series itself. That doesn't mean the card lacks interest, though. My little eyes spy a certain square-jawed Hall-of-Famer in the background, Johnny Evers. 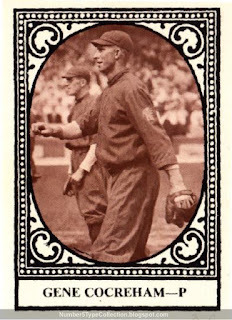 That penultimate member of the poetic Cubs double-play combo won his third championship with the Braves in 1914, following two with Chicago.